I was waiting to give Willy a ride home from school and watched this young man come out and take up his position. He is one of a number of Safety Monitors who help keep order in the halls and assist the younger children cross the street. He walked out smartly, dumped his knapsack on the grass, adjusted his yellow sash, and turned around to do his duty. It is an honor to be given the responsibility of a safety monitor and whoever he is, I was proud of him. Rod from The Scooter Store in Oklahoma City brought over my new power chair. It is a heavy duty model that will last me for a long time. 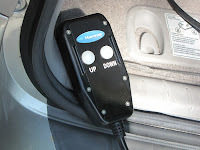 It is controlled by a toggle switch and is fun to drive. I ran it all around the house but will need some practice before I take it somewhere. It is surprisingly maneuverable and can turn around in it own length. We took it outside to load in my new van. Open the rear door, swing the platform out to the street, drive the chair onto the platform and strap it down, then hoist it back up and into the van. Close the door and we are on the way. This is going to make my life much easier, both inside and outside the home. The back door is raised and the Down button on the control is pressed while the platform slides back and then down to rest flat on the ground. 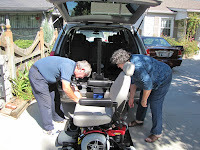 The power chair is driven on top of the platform and strapped in. 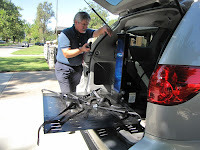 The Up button is pressed and the chair is raised up and then forward, stowing the chair into the back of the van. When the chair is needed the procedure is reversed and the chair driven off the platform. It is very solid and requires very little effort on my part. The chair is to be delivered tomorrow. I am excited. I feel like a little kid about to get his first bicycle. Another easy one. Have fun. 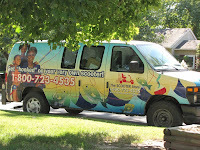 We devoted all day yesterday looking for a new car and settled on a 2006 Toyota Sienna. 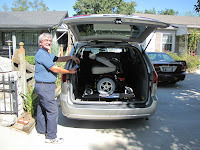 I am getting a power wheelchair and could not fit it into my Mitsubishi. 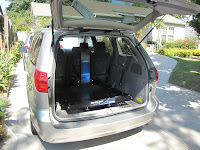 The Sienna has a 3rd row of seats that fold into the floor. 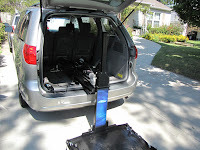 On Monday I will get a power lift that will load and unload the chair into the back of the van, and the chair itself will be delivered later in the week. I wish I did not need one but I can only walk short distances with a cane and it is difficult for Susan to push me around when we go somewhere. The power chair will give me a great deal more independence. It also greatly decreases the danger of a bad fall which is one of the reasons my doctor recommended it. So stay tuned, I will keep you posted. I really was not planning to buy another car but now that we have it I have to admit it is really nice. Best of all, Smokey thinks it is cool. 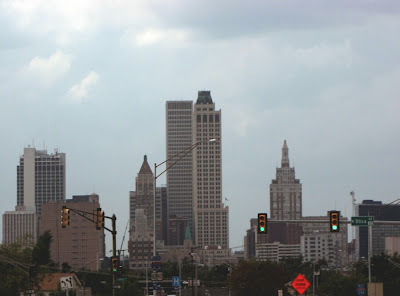 The Tulsa skyline looks good from any angle. At least I think so. I have been consumed by the need to buy a new car today and only have time to quickly share a photo of one of my favorite subjects. I will report on the car tomorrow. 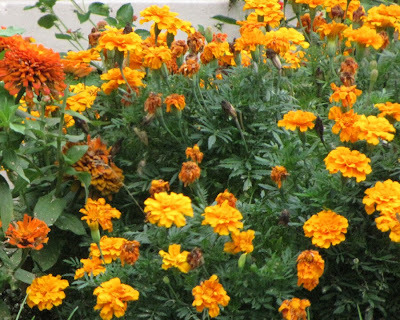 Zinnias and Marigolds - summer favorites. 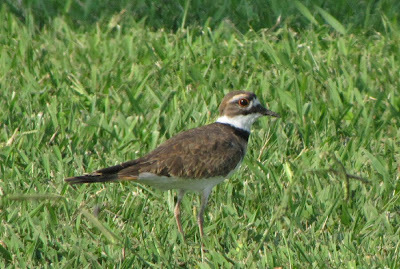 Killdeer are shorebirds you can see without going to the beach, Killdeer are graceful plovers common to lawns, golf courses, athletic fields, parking lots and even gravel bars. These tawny birds run across the ground in spurts, stopping with a jolt every so often to check their progress, or to see if they’ve startled up any insect prey. Their voice, a far-carrying, excited "kill-deer", is a common sound even after dark, often given in flight as the bird circles overhead on slender wings. 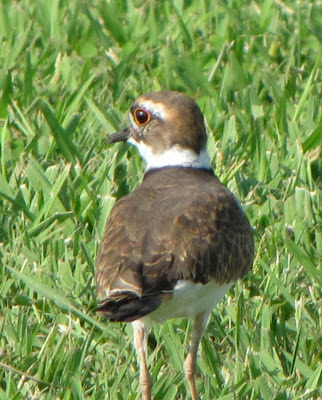 Killdeer have the characteristic large, round head, large eye ringed with rusty red, and short bill of all plovers. They are especially slender and lanky, with a long, pointed tail and long wings. Brownish-tan on top and white below. The white chest is barred with two black bands, and the brown face is marked with black and white patches. The bright orange-buff rump is conspicuous in flight. 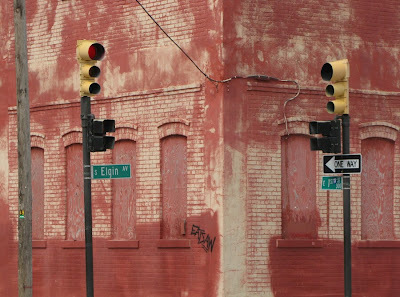 501 South Cincinnati Avenue - Rear view from Detroit. Sue and I went to the Blue Dome Diner for breakfast this morning. 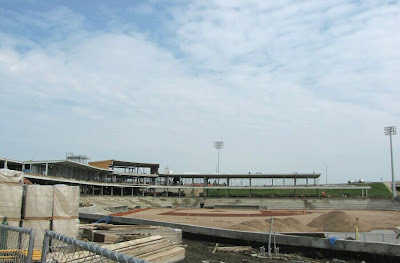 Since the new ball park is only a few blocks away we decided to check on the progress. Despite a lot of rain recently it is begining to look like a ball park. The overall structure of the stadium is up and the infield is laid out. It is supposed to be complete by the start of the 2010 season and it looks like they are on track. Why it's my friend Smokey at my back door. Come in Dog. 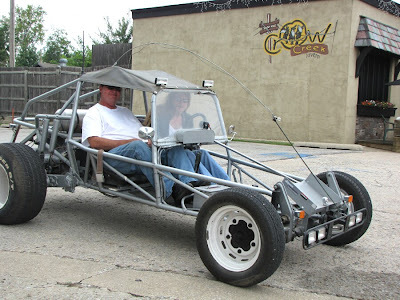 Joe and Ann say their Volkswagon Dune Buggy is a lot of fun to drive. I have no reason to doubt them. It looks like fun to me. 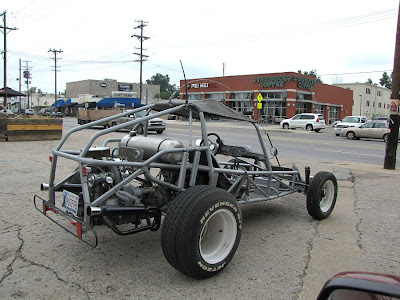 This nifty little dune buggy is basically a Volkswagen drive train mounted in a custom built tubular frame. Very impressive. This is the kind of toys that we boys dream about. Saturday afternoon Susan and I attended an open house sponsored by the Tulsa Preservation Commission. 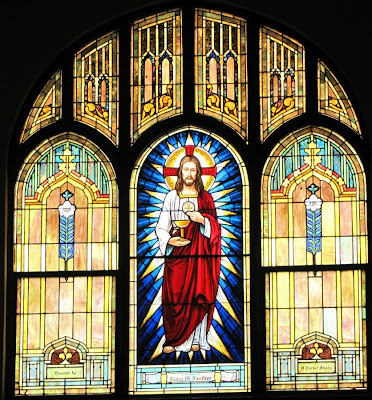 It was held at the Parish Church of St. Jerome at 205 West King Street in Tulsa. 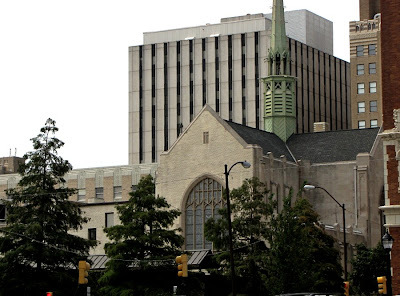 The building was formerly a Presbyterian church and is one of the oldest in Tulsa. 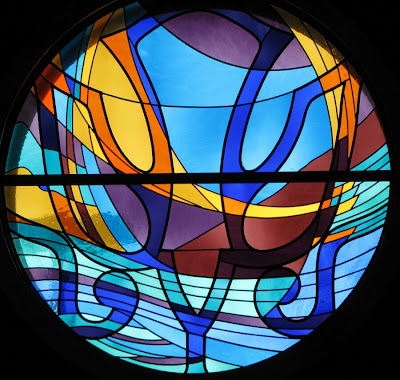 This beautiful window is behind the altar. 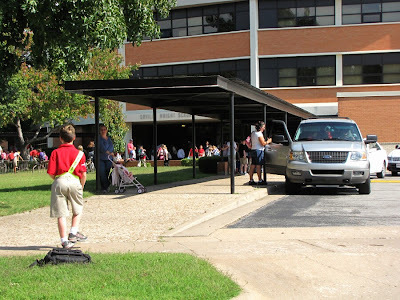 The open house was of great interest to me because it allowed me to meet some people from the Tulsa Historical Society, the Tulsa Foundation for Architecture, and the Tulsa Preservation Commission. These organizations share my interest in Tulsa history and can provide information that allows me to post to my Historic Tulsa Blog. 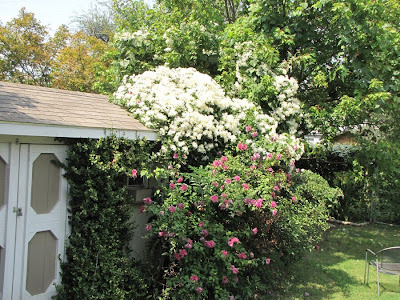 Here is a Crepe Myrtle strong, tall, and in full bloom. There was a bad rumor spread around that Myrtles ought to be severely pruned back every year to prevent them from becoming tall and ungainly. The counter argument is this healthy specimen which has grown tall and lush with a full head of bloom. 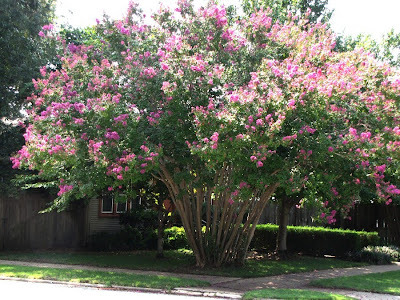 You see, the Crepe Myrtle is actually a tree rather than a shrub, and it feels ill-treated if pruned too harshly. Let the poor thing grow and it will thank you for it. One of many lovely Tulsa homes. An easy puzzle this week. 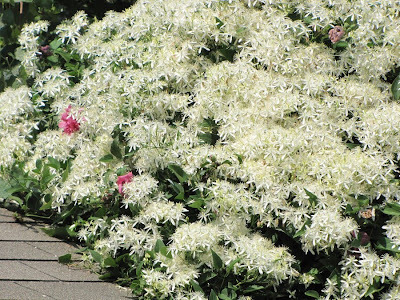 I have wild Clematis growing up and over my Rose of Sharon bushes. When I first noticed the vines growing over the Rose of Sharon I intended to pull them down but procrastinated. Now I'm glad I let them grow. It has made a lovely crown of white blossoms which contrast nicely with the purple Rose of Sharon. 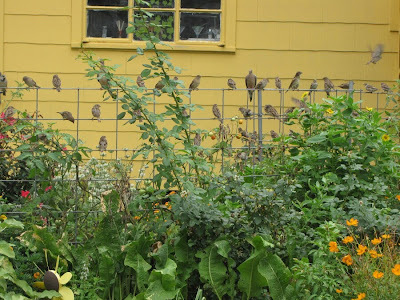 They also attract hummingbirds which I enjoy very much. Besides being pleasant to the eye, they are lightly fragrant. Woolaroc was the 3,700 acre (1,498 hectare) ranch of Frank Phillips, one of three Phillips brothers who founded the Phillips Petroleum Company in 1917. This ranch and the lavish log cabin mansion which he called his "Hunting Lodge" was begun in 1925. 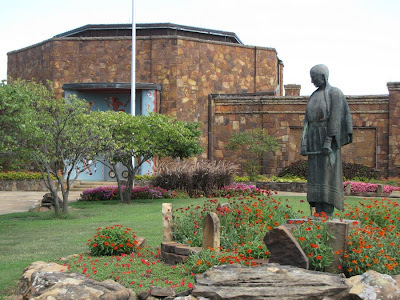 As Frank acquired artifacts and interesting animals the museum and animal park evolved until in 1938 a professional museum director was hired to oversee the collection. Although Frank died in 1950, the museum has continued to grow and expand under the direction of the Frank Phillips Foundation. 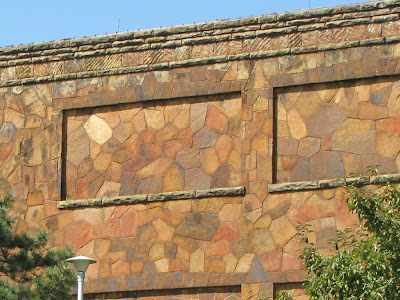 The main part of the museum is faced with native sandstone. It has been expanded several times and features a two story display of the historic Woolaroc airplane that flew non-stop from Oakland, California to Honolulu, Hawaii in twenty-six hours, seventeen minutes on August 24-25, 1927. 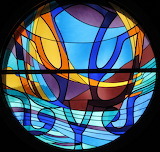 There is an excellent Woolaroc website which is well worth reading. The section with the history is HERE. 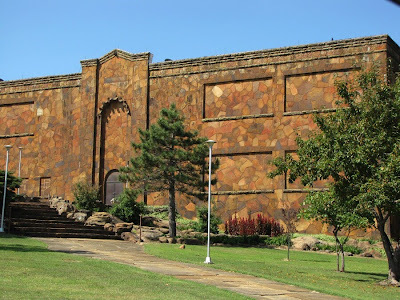 Native sandstone was very commonly used as a building material around the time that the museum was built. I have never seen stones pieced together so tightly that almost no mortar is visible. 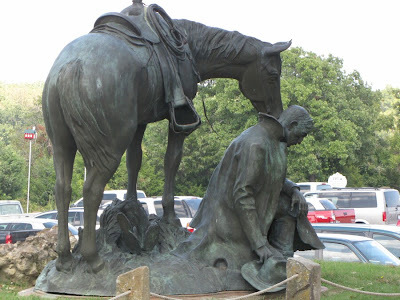 The large bronze statue is titled "Giving Thanks for Rain". It is a recognition of the disastrous drought of the dust bowl days of the 1930s. This is a recent addition to the several museum buildings on site. It combines the log cabin and sandstone style of the older buildings. This is nice stone work but does not have the tight fit of the originals. This kind of stone work is visible all over the ranch, even on road drainage and culverts. But where are the pictures from inside the museum you may ask? Well, the truth is that we didn't go inside, we just drove around the ranch and took pictures of the animals. It was too hot to leave Smokey in the car and Susan did not feel up to pushing me around in my chair so we did all our picture taking from inside the car. You will have to wait for another time. 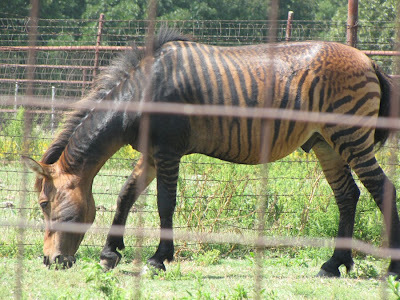 Woolaroc has a rather rare cross between a horse and a zebra. Is it a Zorse? Is it a Hebra? 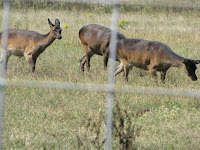 Japanese Sika deer. 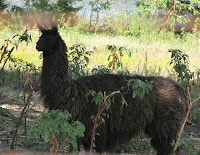 A Llama. 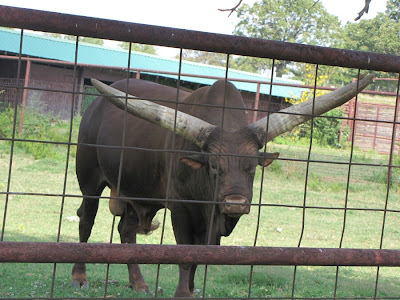 This is a Watusi bull. These horns can grow to weigh 100 pounds. This is a youngster. 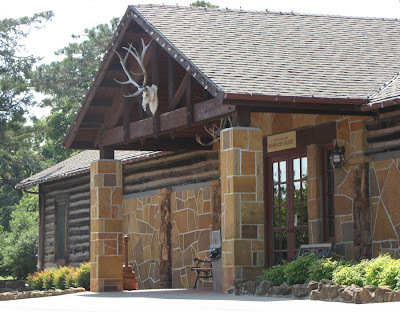 Woolaroc was established in 1925 as the ranch retreat of oilman Frank Phillips. 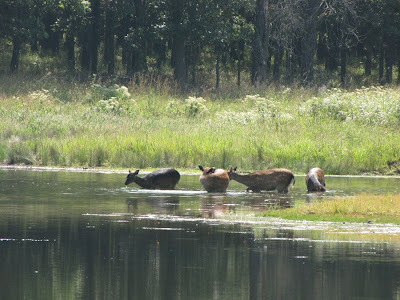 The ranch is a 3,700 acre wildlife preserve. 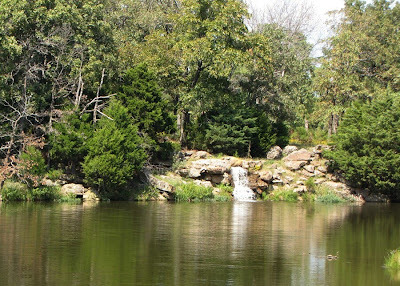 Here a spring makes a lovely waterfall as it empties into one of the lakes. There are actually 3 lakes stepping across the property. 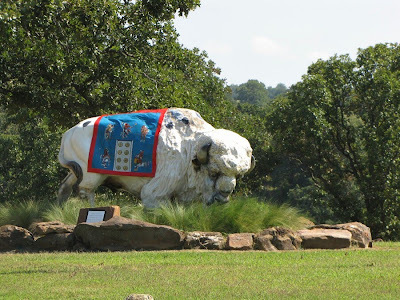 The white buffalo was onsidered sacred by the native Indians who first lived here. This is actually a cast fiberglass buffalo. 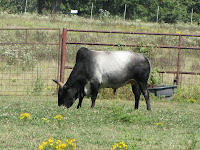 There are 15 of these to be "adopted" by various organizations as part of the Bartlesville Buffalo Stampede. Each is painted in a distinctive manner by the organization with the proceeds going to a charity. The Tulsa World had a nice article on the Buffalo Stampede. 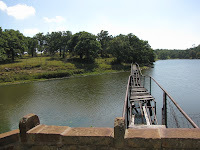 The gounds of Woolaroc are an animal park with many interesting animals not native to Oklahoma. 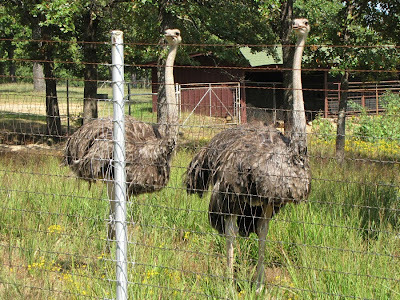 One of the fenced off areas holds a number of Ostriches. Several were standing near the fence and we pulled over for a better look. Most of you know our dog Smokey. 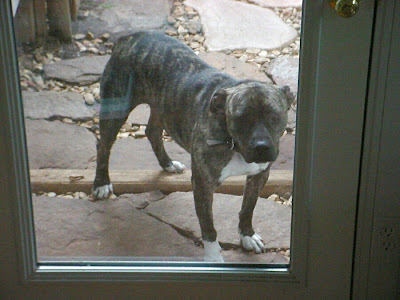 Despite the fact that he is a pit bull terrier, he is a contender for the title of Worlds Mellowest Dog. He very seldom barks at anything and I have never heard him growl. He loves to ride in the car and usually stands behind the center console and lies across it so he can look out the front window to see where we are going. 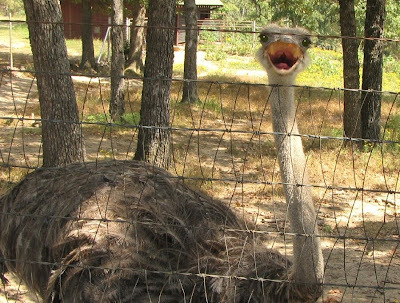 When we stopped to look at the Ostriches he stepped back to look out the side window at what he must of thought were exceptionally large chickens. They looked at Smokey and Smokey looked at them, then he began to bark and growl. I can honestly say that I have never heard him growl before. He was not sure what these creatures were but he was prepared to protect us from them. 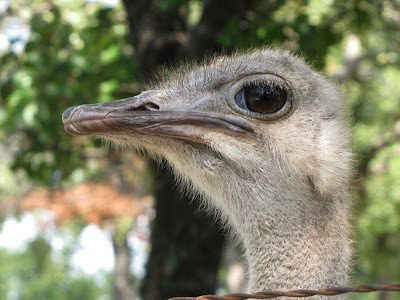 The Ostriches did not seem particularly impressed by Smokey but were hoping we had something for them to eat. I think these were young birds from looking at their plumage. 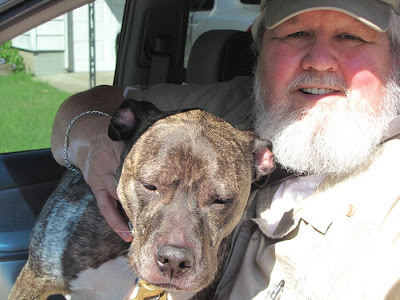 As we drove away Smokey gave a woof that seemed to say, "there, I guess I showed them!"